The Fike Life: 7 QT's! A raw kale and brussel sprout salad. The sincerity just bleeds, right? Needless to say it didn't help. 2. Speaking of Johnny, he just asked me if tomorrow we are going to the merquarium. We are. 4. Speaking of being alone, last night a friend was over and THANK GOD because a GUN-DRAWN POLICE OFFICER CRUISED UP OUR FRONT WALK ASKING IF I'D SEEN ANYONE RUN THROUGH THE YARD (I hadn't). But I had to "go inside" and "lock the doors" while he searched our property. Um, no thank you. He left without coming back to chat it up with me about what the hell was going on so I called the police station to figure out if our lives were in immediate danger or something. And it turns out someone had run from the cops in our area so I imagine it was just a dumb kid doing something dumb and not something worse... anyway... WORST NIGHTMARE. 5. But on the bright side of nighttime... my baby has slept all through the night since we got home from our hike! I'm not talking 11-5:30, I am talking 7:30-7:30. Whhhhat! A part of me wonders if that's because our baby monitor (Kirby) isn't here but I did hear him make a few sounds last night and he just fell right back to sleep. Blissy bliss bliss. 6. 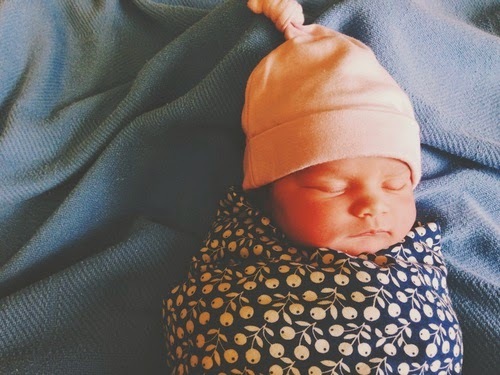 Speaking of bliss, did you all see that Jenna had her BABY GIRL?? Primrose Lucia was born last Saturday morning and I had the privilege of crying in a hotel bathroom in Fresno upon getting the first text pic. She is so lovely and sweet and I adore Jenna's birth story. She was a two time home-birther that decided on a medicated hospital birth for this one and I'm so impressed with her for making that leap so fearlessly. I bet she will inspire many a woman to not feel pigeonholed in their birth choices. Love that girl. 7. And this one. She has been driving me nuts lately with cute. 8. The other day I googled "best ballet flats ever" and the first thing that came up was Topshop's Woven Ballet Pumps. And so I followed that link and LO AND BEHOLD they were on sale for $8 with free shipping! Heyo! I bought them and they came yesterday complete with a British postal worker (yes, I made that joke but I don't think he loved it.) And let me tell you, they are dreamy! Butter soft and super comfy. I can already tell they will stretch and become those perfect flats. Just like my google search was hoping for! Anyway, I just checked back and they are back on sale for $12 now which is still 50% off. Go forth! Get thee some flats! How can you watch pretty little liars alone? I can not. I can't. I have. It sucked. I had nightmares. :) I'm a baby. Just updated my self on all of your recent posts! I'm slow. Or just on the go a lot lately! Loved the hiking post, it actually made me cry a little. Encouraging and beautiful. Really considering starting a blog soon. Hopefully it's something I actually do not just talk about! Thanks for your kind words back on my post a week ago. Really made my week! :) cheers to you! Pretty hard to pass up! Ah! Your dinner story: the sweetest ever. And kale! Ha! Oh I like your method for shopping for shoes! Totally brilliant. Seriously! I thought everyone's MO is to stay up all the night hours when husbands travel. Our three year old gets to have "sleepovers" in mamas room while papa is away, thank God he does too! I love the new header but boy am i going to miss chocolate dipped boy! My husband is doing that this month a lot. Boo. Maybe I'll do something like that (with the childrens) too. And that (police officer thing) has happened to us a few times too- we on a quiet road that's right off of a major route and we have woods all around.... sooooo..... hopefully we won't get any of that this month. You are most definitely not alone!! Ahhh, I SO need a pair of comfy flats! And love the color of those!